Oh, that giddy sensation! Have a hot date, but what to wear? Should I shave? No, the rugged look should be fine, the beard isn’t grizzled yet. So I’ll wear jeans, but which top? I don’t want to wear some other jersey, that might look to desperate. I’ll opt for my green striped pullover (vertical stripes of course). But why all this concern for sartorial style? There’s a new suitor in town vying for my affections. 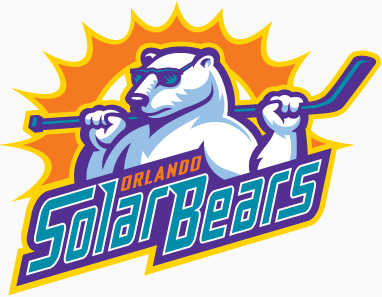 After a long ‘hibernation’ the Orlando Solar Bears have returned! When last we saw them in the 2000-2001 season they won the Turner Cup! And then their league folded – which short of an actual lockout is the worst momentum killer for a team. (I’m looking at you, NHL). I took a vacation day (use them or lose them) and attended an open team practice before the preseason began and walked in just as they were hitting the ice. As they circled around and fired pucks at the empty net, I heard more hits off the boards and glass then anything. For all I know, that’s how they begin each practice, trying to keep pucks out of the net. I had downloaded a handy roster from the team website, but it didn’t seem to match up. Number Four is supposed to be 6’7” and 221lbs but he was one of the shorter players on the ice. It was then that I discovered that the number on the helmet was completely different. So the numbers on the practice jerseys mean nothing. Did no one do laundry? What’s going on? So by getting closer to the boards, I was able to see the helmet numbers and identify the players. They started with some one on one drills that looked like they were designed to force the players to really fight for the puck and their positioning. But really, I have no idea. I couldn’t hear what coach was barking to the players. His voice came across like one of the teachers in a Peanuts special except instead of that trombone sound it was like a goose with an adenoid problem and a two pack a day smoking habit. So it made it a bit like Charades. I had to try to figure out what skills were being worked based on the drill. Every now and then, the drills would stop and the team would skate laps around the rink. Some players seemed to take this more seriously than others. I admit that I enjoyed watching this drill quite a bit, even though it smacks of having to “Dance For Grandma”. This quaint term is something us performers often hate. Its provenance comes from the angst of having to perform your dance routine, piano, violin, juggling act – whatever you are doing when you are young – for your Grandmother or some other relative (or worse), especially when you are tired (or mortified). Now performers use it as grown-ups to refer to having to perform for backers or producers (or producers’ relatives). It’s that exasperated, put-upon sense of ‘Why must we prove that we have talent?’ in which performers love to wallow. (Have I mentioned I’m a performer? Resume available upon request. Please – no children’s parties). After an hour, the world’s oldest Zamboni came out to resurface the ice. Seriously, that thing was ancient. I’m fairly certain I was inhaling Freon. Once the team came back I began to make more critical assessments. #9, Derick Martin, had those Max Talbot ‘come hither’ bedroom eyes. #22, David Lun, had the best hockey hair. And # 23, Matthew Panzo, was apparently twelve years old. Both goalies were left-handed catchers. Brooks Ostergard was the taller of the two, but I thought that Drew Palmisano, though shorter, was quicker moving and had a better glove hand. I was proved wrong when the team let him go after their first two preseason games – both losses. They also lost their first two regular season games. To be fair they did lose one in OT, so they did get a point. And then they come roaring back to win the next game 8-2 setting the stage for what would hopefully be an exciting rematch with their rivals the Florida Everblades. 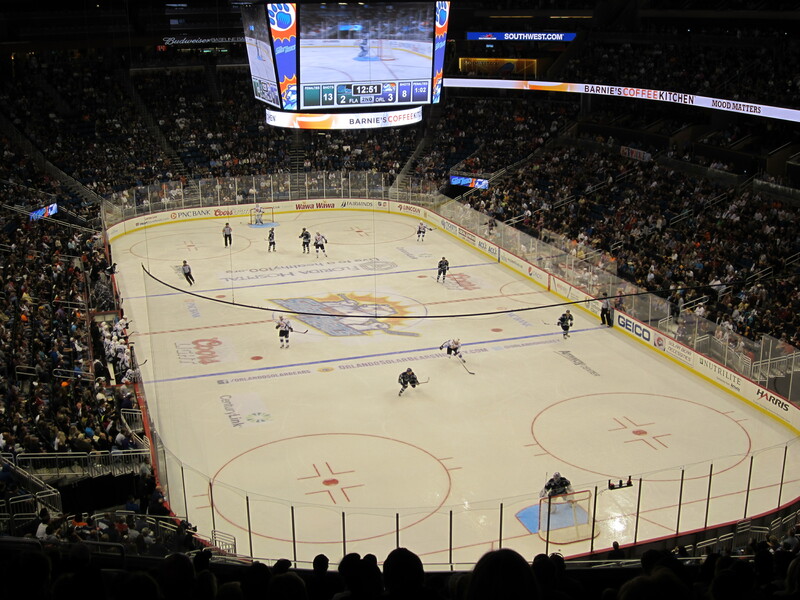 (Yes, I know – Solar Bears, Everblades….. I really should make fun of those names, but that really takes care of itself). As it turned out the Solar Blades home opener at the Amway Arena was SOLD OUT* (*Upper tier not open, so while a ‘sell-out’ the arena is not actually full). 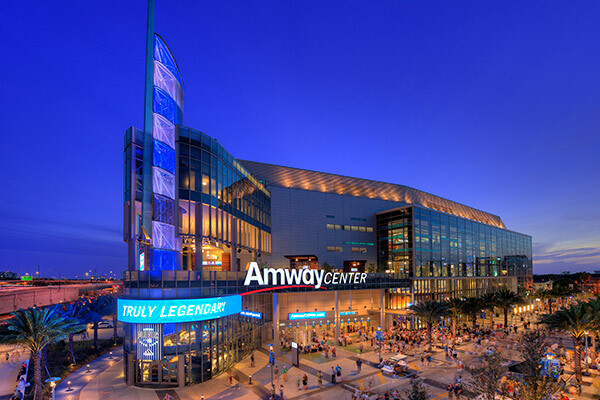 The new Amway Center is a replacement for the old Amway Arena (formerly the Orlando Arena, the T.D. Waterhouse Centre -yes, Centre or just plain ‘O-rena’). The new Arena is quite spacious and had an exhibit of Orlando Magic memorabilia highlighting excellent athletes who just never worked out for whatever reason (Oh look, Scott Skiles’ jersey!) but since this isn’t a basketball blog and I haven’t cared about that sport since they started wearing those long, baggy shorts, we will move on. 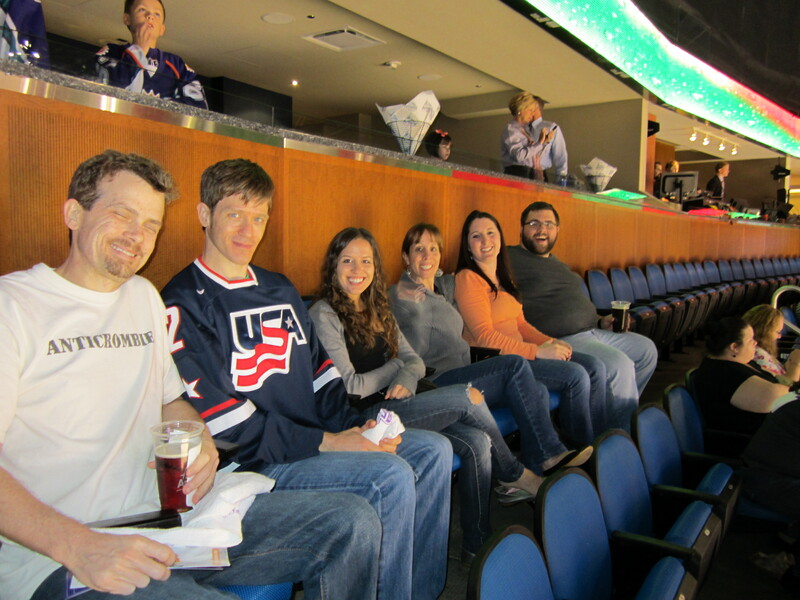 Coincidentally, the only other time we at the Amway Center was for hockey. It was a pre-season game between the Tampa Bay Lightning and the St. Louis Blues where an underage drunken fan threw up in the vicinity of Lighting owner Jeff Vinik (stay klassy, Orlando). This was a far more family friendly crowd. Not to say there was no cursing or drinking. And no not from me – there were hipsters there. We had a fun group of seven. Me, LSP, Other Gay Fan (OGF), his co-worker Cindy with daugher Sue, Ashley and Zac. So four gay men and three women. And while Zac was the only one who had not seen a game, he was very enthusiastic. He tweeted several photos during the game. (My favorite: he tweeted a pic of the jumbotron replaying a fight and wrote “Now girls, you’re both pretty”). The pregame atmosphere was very festive with games and face painting for kids. As a special souvenir, all fans were given commemorative towels which OGF immediately spoiled by calling a bedside rag. (It could also be a workout towel, but please call it a souvenir). Our tickets were in the very last row, but still excellent view as you can see from this photo taken from our seats. There was a pregame ceremony introducing the players that involved fire and some fairly tame pyrotechnics. It was at this point that I realized that many of the remaining players had changed numbers. 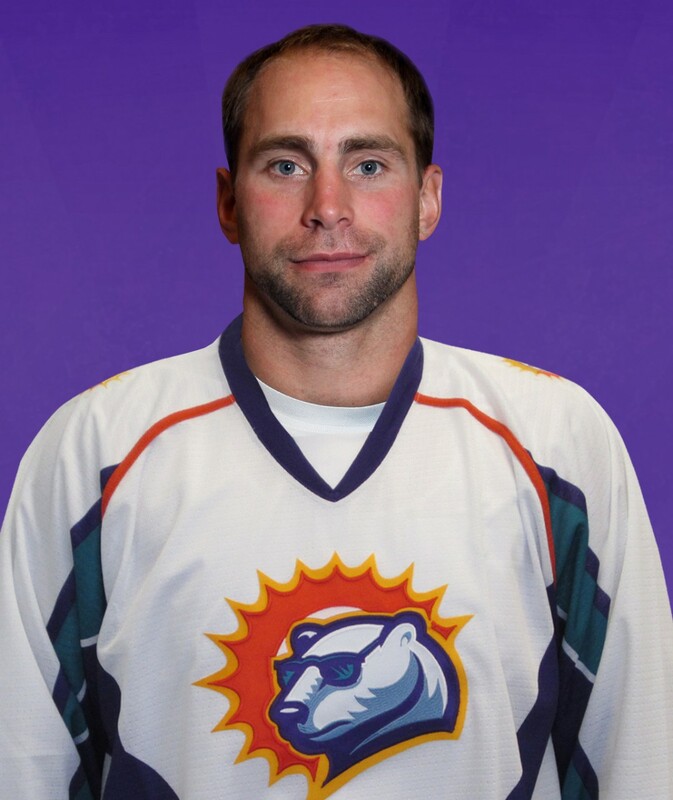 (Note to Solar Bears management: Maybe some programs or at least a roster sheet? Did you spend all the money on bedside rags, er, Souvenir Towels)? Then beloved Solar Bears mascot “Shades The Bear” skated out to that now classic rap by MC Hammer, “U Can’t Touch This”. It seems fairly clear that it’s difficult to skate in that costume. Then during the ceremonial puck drop, to the surprise of no one, Orlando Mayor Buddy Dyer was roundly booed. Then Crash, a local rock radio DJ adorned the National Anthem with several melismas using his fine whiskey cured voice. A half and hour later, the hockey began. One of the big differences I noted between games in the NHL and the ECHL would be the passing. It’s amazing how you take the tape to tape pass for granted in the NHL. Here they can be summed up by another hockey arena anthem “Whoa, whoa/ We’re halfway there/ Livin’ on a prayer.” Also faceoffs are an extremely haphazard affair. Perhaps positions and skate placement are determined by the spinner for the game Twister. And it was apparently the announcer’s first time at a hockey game. Not only did he have some difficulty with the French-Canadian names, he also announced a three-minute penalty at one point. The first intermission featured “Mites On Ice.” Yes, young children play a four-minute game. It’s just as adorable as you would think even with the Chipmunk-like music playing in the background. I realized that watching little kids skate is the straight guy equivalent to watching cute cat videos. 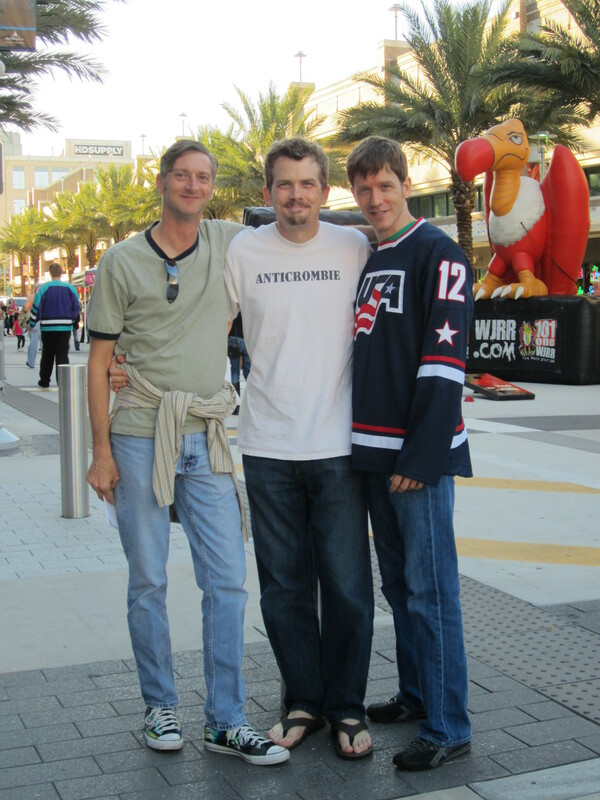 Then a fan won an autographed Solar Bears jersey from Rob Thomas of Matchbox Twenty. Why that was exciting, I’m not sure. I should point out that there were jerseys of all kinds in attendance. 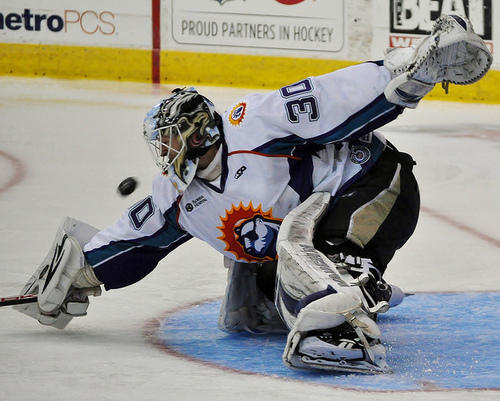 Old Solar Bears jerseys, new Solar Bears jerseys and even a few Orlando Seals jerseys. Plenty of Red Wings sweaters as well as Boston, Chicago, Philly (blech) but fortunately no Montreal jerseys were seen. Bonus points to the Hartford Whalers jersey with Pat Verbeek (Little Ball Of Hate) on it. We had the 4 on 4 overtime for five minutes and then just like in the NHL, we went to a shootout. A TWELVE ROUND shootout. Yes, the crowd got there money’s worth. Fortunately the Everblades goalie had a weak glove side (the Bears got that scouting report, they shot high glove side on him for most of the night) and finally Sean Lorenz managed to get the winning goal and the whole place erupted. Certainly we had a great time – even Zac who was never really sure what was going on all night. His synopsis: “It was really exciting and then it got kind of boring and then it got really exciting at the end.” Scoff all you want friends, but that’s a pretty fair description of several games I’ve seen. And that includes those on the NHL level. Bottom line (hehe…. bottom….) we will be going back. It’s far cheaper than NHL tickets and games are only ten minutes away instead of the hour and a half it takes to get to Tampa. Plus, we got a complimentary rag. This entry was posted in Tampa Bay Lightning, The Minors and tagged bedside rag, Brooks Ostergard, Charlie Brown's teacher, Dance for Grandma, David Lun, Derick Martin, Drew Palmisano, Florida Everblades, John Curry, Mathew Sisca, Matthew Panzo, Orlando Solar Bears, Sean Lorenz, The Minors. Bookmark the permalink.